Emkay Global is a major player in the financial services sector and has been creating wealth for the clients for over two decades now. The full-service stockbroker was founded in the year 1995 with a vision of assisting clients with financial advice based on sound research. Emkay Global caters to equity cash, equity futures & options and currency futures & options. It is a member of the cash, currency and derivative segments of BSE, NSE and MCX-SX, and also acts as a depository participant with CDSL. Emkay Global has achieved a milestone in serving its clients at home and abroad including the foreign institutional investors, domestic mutual funds, hedge funds, banks, private equity firms, insurance companies, small and medium-sized enterprises and high net worth individuals. The expertise of Emkay Global lies in thorough qualitative and quantitative research, which helps in make sound decisions for its clients and create wealth for them. This helps the company to maintain long-standing and successful relationships with its clients. Institutional Equities – In order to cater to the needs of the institutional clients, research firms need a deep understanding of the market dynamics and identify the best investment opportunities before anyone else could. Since institutional investment involves big money, thus to gain an edge over others, Emkay Global organizes management meets, con-calls, company visits and more. The financial managers help the institutions to have a closer look at the market scenario and put their money accordingly. Portfolio Management Services (PMS) – Emkay Global is a SEBI registered Portfolio Manager. It offers PMS services through it the Asset Management arm – Emkay Investment Managers Ltd (EIML). Wealth Management – Emkay Global offers advice to its clients over how to manage and grow their wealth by understanding the investment profile. Before diversifying the portfolio of the investor and allocating money to different financial instruments, the firm aims to understand the risk appetite. Accordingly, the funds are divided, and returns are generated. Once the allocation is done the firm also monitors the investment regularly to make sure that that the portfolio is performing well. Insurance – The firm offers the insurance service for both individuals and businesses. Emkay Global has a skilled group of researchers, who are acknowledged across the industry for their thorough understanding of the market dynamics. Over the years, the research team has demonstrated its capability of identifying the mid-tier companies while they are still dirt cheap so that the client can enjoy strong returns in the long-run. Emkay Global is also recognized for its bespoke research, which is conducted after considering the clients’ individual research requirements. Research is largely divided into three categories: Perspective Research, Corporate Research and Alternative Research. Perspective Research Division – The division helps the clients in understanding all the events, developments and movements happening in an economy, companies and sectors that are detrimental to investment at both the micro and macro level. Within the Perspective Research, Emkay Global has Thematic Research Division, wherein the research analysts in the company look for trending themes, factors and other aspects. Once the right theme is identified, the researchers then dissect it from every aspect to come up with the winning trade and assist the clients with it. Another part of the Perspective Research Division is the Economy & Strategy, wherein the research team understands all the economic drivers. These drivers are then used while presenting data that impacts the portfolio of the investor. Emkay Global publishes regular reports on the factors such as fiscal policy, prices of key commodities such as oil and gold, currency fluctuations that affect the investment in many ways and also government debt. Corporate Research – Emkay Global analyzes big companies and their financials to come up with better investment ideas. Moreover, their exposure to the large corporates and managing their portfolios also helps in building a profound understanding of the fundamentals of the corporate research. Within the Corporate Research, Emkay Global offers Sector Research, wherein the researchers offer an all-around view of the key sectors, thus, identifying the sectors where the investors should put their money. After the thorough research and analysis of the recent economic scenario, the researchers forecast the sector’s performance in the coming months. Emkay Global offers a unique service is known as Bespoke research, wherein tailor-made reports and investment themes are sent to the clients. Under the Bespoke research, the researchers study the historical performance of an individual stock forecasting the future results. Further, researchers also do an in-depth study of the stock. The bespoke division helps the clients to explore upcoming opportunities backed by insightful research. Alternative Research – Emkay Global also conducts diverse Quantitative Research studies to educate clients on a range of topics, like volume and open interest analysis, Cost of carrying, Implied volatility analysis, Put-call ratio analysis, and more. Emkay Global, apart from their registered and corporate offices, has a physical presence in a few cities and towns. Apart from that, you can contact the full-service stockbroker through email and the phone numbers. Address and phone number of the Administrative office are mentioned on the stockbroker’s website as well. Thereafter, the clients can also get the contact number by selecting their city and branch. The same arrangement is also made for the franchisees. Further, there are also options to get a call back from the company. 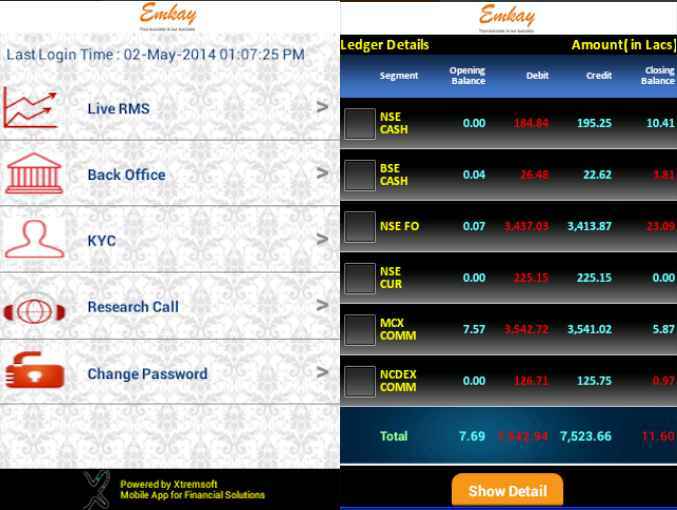 Emkay Global offers all forms of the trading platform. They have a trading software terminal called Nest, while their web-based platform can be accessed via trade.emtrade.in. They also have a mobile app for trading. Order placement of different kinds such as Market Order, Limit Order, Stop Loss Order etc. Market watchlists, charting, technical indicators for technical and fundamental analysis of the share market. NOW is relatively bulky in usage and thus requires a decent configuration of your computer or laptop. Since, it is a third party trading platform, in case you have any feedbacks – Emkay Global Financial services will not be able to assist you directly with them. Emtrade is the web-based platform of Emkay Global. It is a revolutionary charting and trading software, backed by unparalleled analytics and seamless execution. Emtrade is user-friendly and reliable, and very easy and simple to install. Emtrade is built with more than 100 technical indicators, modules for strategy creation, drawing tools, global indices, buy-sell alerts and provides access to real-time data. The platform also provides live support during the trading hours and a special mentoring class for trading once a week. The advantages of Emtrade include 100 days intraday history, option strategies, multiple charts, strategy creation, technical indicators, smart trader online, videos, audios and ebooks and zero subscription cost. 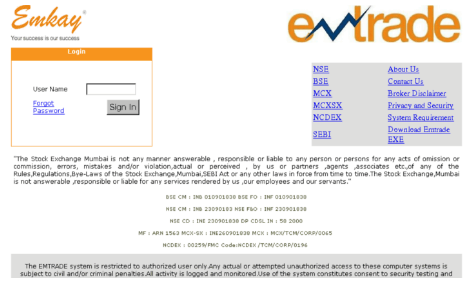 Like NOW, Nest is also a third-party trading software which is EXE based. However, NEST is relatively more mature than NOW in terms of the number of features and speed. Option to add multiple market watchlists. When it comes to the user experience of NEST, there are quite a few concerns in terms of navigation and features usage. This can be a bigger problem, especially for beginner level traders. Research and tips offered by the broker on a regular basis. Back office display with information on Holdings, Positions, Ledger details etc. Check this Emkay Global Brokerage Calculator for more information on brokerage, taxes, GST, Stamp duty etc. At the same time, this must be known that Exposure is a double-edged sword. If you have no idea about the implications or risks associated with exposure, it is better not to use it in the first place at all. This is for the simple reason that it can be hazardous to your trading account balance. Tons of Experiences – The firm has over two decades of experience in the equity market and other market instruments as well. There is a well-placed hierarchy in the company that lets smooth running. Robust Research Support – Emkay Global boasts of an award-winning research team. The research team is focused on identifying the stocks that have the potential to grow into multi-baggers. Recognized Services – Emkay Global has won many awards in different fields for offering best-in-class services and also building a long-term cordial relation with the clients. Embay Global is backed by strong research services and tools, thus helping it use a systematic approach to create wealth for the clients. The company takes pride in its relationship with its clients. It is dedicated to serving its clients the best and maintaining long-term successful relationships. There are designated relationship managers for the clients. The trading software and mobile applications are very easy to use, hassle free and technologically advanced. High Brokerage – In the time where the young broking companies are charging minimal or sometimes nothing from the client for certain services, Emkay’s brokerage is not too competitive and maybe even slightly higher compared to others. Though their brokerage is negotiable, still the first impression is not good. The offline branches are only limited to some states. The trading platform does not have the facility of instant fund withdrawal, and certain tools like margin calculator and brokerage calculator are missing. In all, Emkay Global is a well-known broker with experienced researchers that have an upper hand in offering well-researched reports and stock picks to the clients, thereby, creating a value portfolio for them. With so many accolades and awards to its credit, Emkay Global has achieved a place for itself in the top broking firms of the country. Setting few things right such as high brokerage cost could open up further opportunities for the broker. In case you are looking to get started with a demat account, just fill in some basic details in the form below. Emkay Global has one branch in Andhra Pradesh in Rajahmundry, one branch in New Delhi, one in Gujarat in Ahmedabad, one in Jharkhand in Ranchi, one in Karnataka in Bangalore, one in Kerala in Cochin and three branches in Maharashtra in Mumbai, Nashik and Pune. The company also has one branch in Orissa in Bhubaneswar, one in Rajasthan in Jaipur, one in Telangana in Hyderabad, two branches in Tamil Nadu in Chennai and Coimbatore, one in Uttar Pradesh in Kanpur and one in West Bengal in Kolkata.